The Korean Central News Agency issued the following on December 13, 2013. The English version of the article was issued in two takes. The first take runs about half the length of the full story until the “(more)” below. The story was then updated with the second half. So when the story originally ran, only the headline referred to Jang’s execution. Details and the speed at which it was performed did not appear until the update, which runs to some 2,749 words. 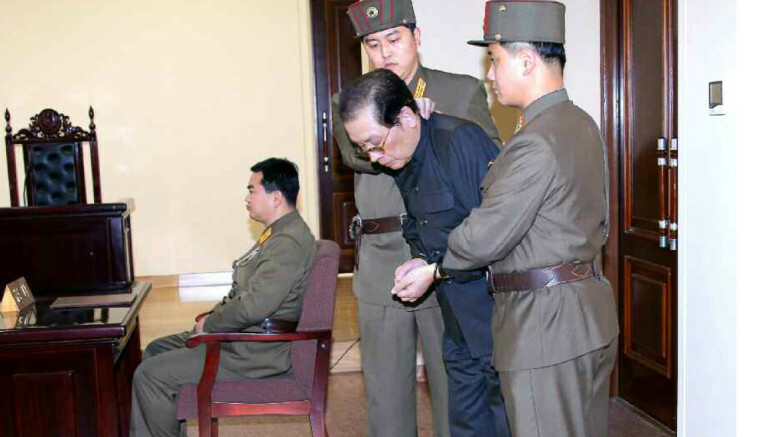 8 Comments on "Full text of KCNA announcement on execution of Jang"
Show trial. This is outrageous! Is there no justice in North Korea? “trial” from the Stalin era. Somethings never change. Hysterical Communist rants amongst ’em. Why worse than a dog? Dogs are better behaved and more caring than many humans I have met. Why is anyone surprised, let alone shocked? Perhaps the Dear Leader is making necessary progressive and enlightened steps to purge the Democratic People’s Republic of reactionary, counter-revolutionary ‘old guard’ elements who would otherwise pose opposition to the process of continuous revolution by assuming a position of priviledge above the common people and thereby seeking to establish a personality cult whereby they ride like kings on the backs of the people, rather than lead, guide and inspire them along the path to liberation. The imperialist western mind is incapable of comprehending this, largely because its so-called ‘democracy’ is little more than a minority elected dictatorship that immediately abrogates the electorate of any sense of political responsibility, and reduces them to the status of running dogs for the capitalist bourgeoisie. What is it with communists and dogs……? There’s no concept of freedom of conscience in the chilling communist mindset. They have to force ideolgy because It’s so extravagantly hostile to the best thing about being human, a free creative human spirit; freedom of expression , religion, movement and will. Thats why they have to pipe In mind control to every home and hold the nation captive because the slightest crack will allow the human spirit to bud forth and quickly flourish. That last line was chilling.